Known globally as the hobbit Pippin in all three Lord of the Rings films, Scottish actor Billy Boyd is also an accomplished musician, singing, playing guitar, bass and drums. He fronts the band Beecake named after his LOTR co-star, Dominic Monaghan, sent him a picture of a cake covered in bees. Billy wrote the song The Edge of NIght for Peter jackson’s last instalment of LOTR The Return of the King. Billy just finished a season of ‘the Scottish play’ at Shakespeare’s Globe in London this week. He signed my sketch on the last day. 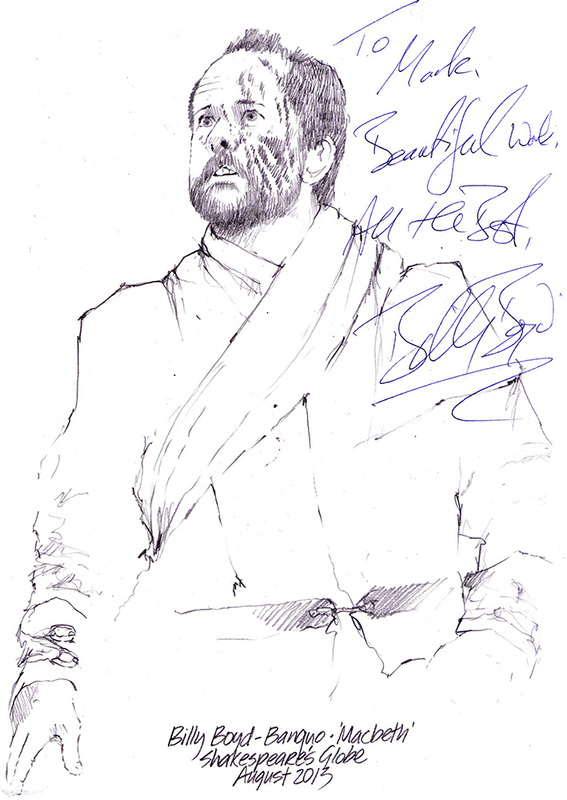 This entry was posted in Celebrity, Theatre and tagged Art, Autograph, Billy Boyd, Chicane, Drawing, Lord of the Rings, Macbeth, Mark Winter, Shakespeare, Signature, sketch by Mark Winter / Chicane. Bookmark the permalink.